Mississippi's Republican secretary of state, Delbert Hosemann, is publicly apologizing after he incorrectly told college students that Republican former U.S. Sen. Thad Cochran is "deceased." ABC News. Thu, 25 Apr 2019 18:26:02 -0400. Reuters. Thu, 25 Apr 2019 12:07:50 -0400. Individuals in Mississippi who have given their bodies for scientific research and education are being honored for their sacrifice. NPR. Thu, 25 Apr 2019 10:00:00 +0000. Washington Times. Thu, 25 Apr 2019 04:31:47 -0400. Amiyah Evans, from Clinton, Mississippi, had eaten a burger on Friday night. The next morning, she woke up with a slightly swollen lip - which soon swelled. Daily Mail. Wed, 24 Apr 2019 21:56:59 GMT. Anna Wolfe. Mississippi Today. Wed, 24 Apr 2019 15:10:07 +0000. Mississippi State edge rusher Montez Sweat could provide an immediate lift to the defense, but the Detroit Lions will have a lot of options with the eighth pick in the NFL draft. By Rob Reischel, Contributor. Forbes. Wed, 24 Apr 2019 12:00:00 +0000. ABC News. Tue, 23 Apr 2019 19:42:25 -0400. Eric Roper. Star Tribune - Minneapolis, Minnesota. Tue, 23 Apr 2019 02:37:47 +0000. Dan Browning. Star Tribune - Minneapolis, Minnesota. Tue, 23 Apr 2019 00:44:51 +0000. Washington Times. Mon, 22 Apr 2019 01:44:13 -0400. ESPN. Sat, 20 Apr 2019 12:16:06 EST. 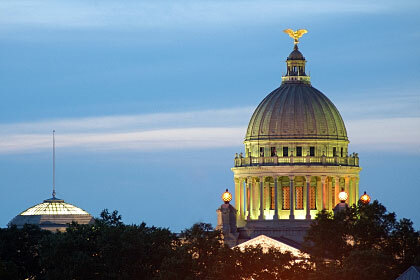 According to the 2010 census, the population of Mississippi was 2,967,297. In 2008, the estimated population of Mississippi was 2,938,618, whereas in 2006, the population of Mississippi was about 2,896,713. For detailed, up-to-date information about Mississippi's demographics, visit the U.S. Census Bureau's QuickFacts about Mississippi web page. For maps of Mississippi, visit this Mississippi Map website. The photograph above shows the state capitol building in Jackson, Mississippi. Mississippi newspaper publishers are listed here, along with their addresses, phone numbers, and website links; Mississippi library names, descriptions, and website links are listed on this page. More information about Mississippi can be found here.